What do Canadian Parliament and a hospital in Ghana have in common? An inspiring link through one of FH Canada's development programs. 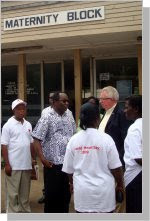 The Korle Bu Teaching Hospital in Ghana received a visit from Rt. Hon. Joe Clark, who served as Prime Minister of Canada from June 4, 1979, to March 3, 1980. 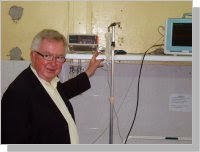 Mr. Clark visited this hospital to see what was being done with a recent delivery of nearly $1 million worth of refurbished medical supplies and equipment, given to the hospital's maternity ward through FH Canada's International Medical Equipment Distribution (IMED) program.